Michelle Mills - Ind. Stampin' Up! Demonstrator Brisbane, Australia: Have yourself a Merry Little Christmas! Yep...I'm back to making christmas cards again and playing with the new stamp sets from the soon to be released 2017 Holiday Catalogue. You can never be too prepared for Christmas I think and every year I say I'm going to get an early start, in August, on my cards so that way I can make heaps and have them ready by November. Well this year, I'm doing it and it feels good. At this rate, I'll have between 50 and 100 so there will be no excuse not to send them. I saw this card on Stampin' Pretty recently - you may know her as Mary Fish, a demo in the U.S. There is so much I LOVE about this card! The layout, the color combo, its clean and crisp and fresh. So I though, lets CASE it and turn it into a Christmas card. I have used 2 new Christmas stamp sets called Watercolor Christmas and Seasonal Chums The Watercolor Christmas set also coordinates with a new Christmas Project Kit. 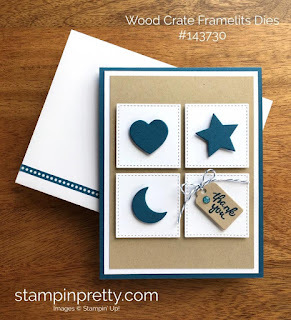 The square Stitched Shapes framelits Dies make it super easy to create matching size squares. I'm really looking forward to sending out my cards this year. Each one of them will be different so plenty of variety indeed. Thanks for stopping by to check out my project.